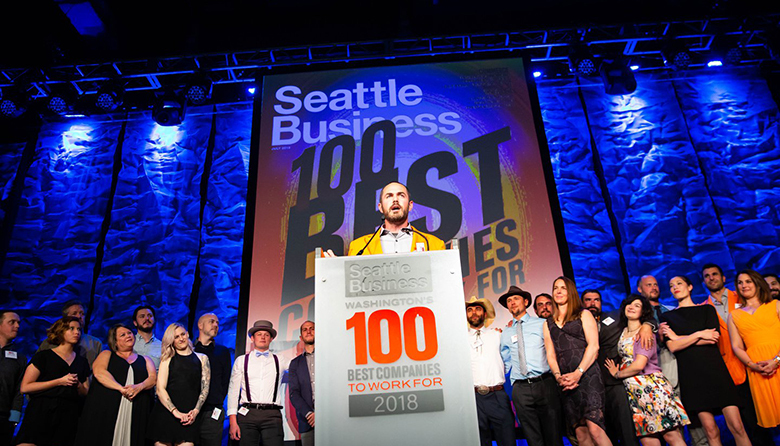 The 2018 Washington’s 100 Best Companies to Work For event celebrated companies of all sizes based on top scores collected from an anonymous workplace survey. More than 77,000 Washington state employees received the survey and answered questions about their workplace based on work environment, rewards & recognition, benefits, communications, responsibility & decision-making, executive leadership and more. The top 100 companies were honored at an awards banquet, held at the Washington State Convention Center. Watch the video below from the event. See our photo gallery of the event on our Facebook page. See the full list of this year’s 100 Best Companies to Work For here. In print, you can find the full feature story on all our honorees in our July issue.